Bulldozers, Backhoes, Wheel Loaders, Forklifts, and more. We are Direct Suppliers of Atlas Copco, Sandvik, Dynapac, Komatsu, Baldwin Filters, Donaldson, Fleetguard, Dana-Spicer, Ingersoll Rand, Doosan (Industrial and Construction Compressors, Generators, Compactors and Lighting Systems). We also supply almost all brands and models, specially Bomag, Caterpillar, Case, Cummins, Dana, Spicer, Clark, Detroit Diesel, Grove, Hitachi, Hyundai, Isuzu, Jcb, John Deere, Kobelco, Link Belt, Lister Petter, Mercedes Benz, Mitsubishi, P&H, Roadtec, Rockwell, Terex, Volvo, ZF Transmission, Vermeer, Mack, Kenworth, Peterbilt, Freightliner, ITR, Berco, V-Track. 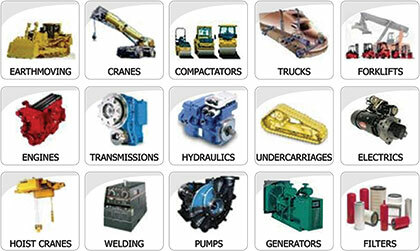 Generators and engines from Onam, Cummins, Kohler, Wacker, Terex, Multiquip, Kubota, Lister Peter, Mitsubishi, Deutz, Iveco, Hatz, Yanmar, Perkins. We’re your #1 source for Heavy Machinery, Parts and Components for Mining, Construction, and many other industries. Need help?